When Bubbles was born, I couldn't see her eyelashes at all! Given that I won the "Longest Eyelashes" round in a kids' game at Sunday School, I was thrilled when her eyelashes became visible as she entered her 2nd month. They have since gradually grown longer. They are most visible when she is asleep, especially the strands closer to her nose. The rest kind of tuck under her eyelids at the outer ends of her eyes. 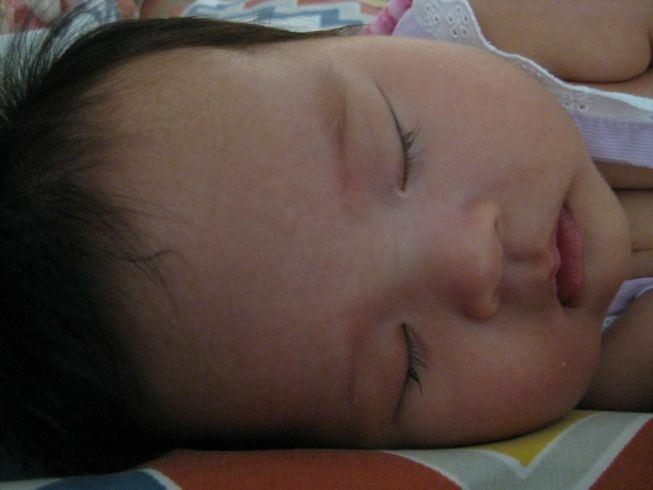 There's just something pretty and delicate about a sleeping baby's eyelashes! Haha, yes Jireh does have really nice lashes! They just come out of nowhere, don't they! Yup, just like how I didn't realise when her hair started to stick up.